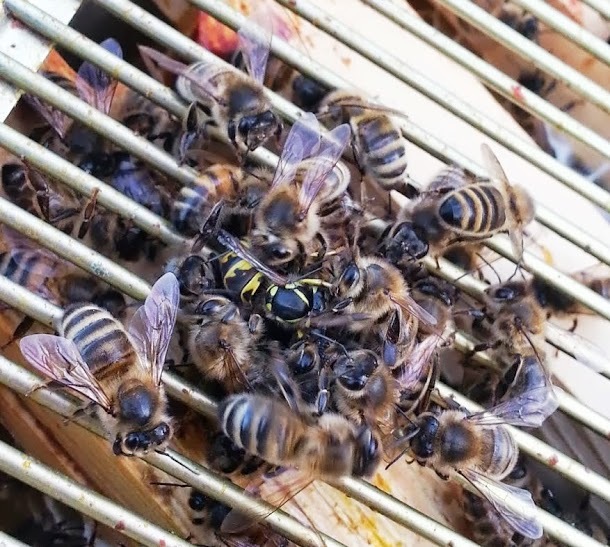 I was inspecting my bees on Thursday evening and removed the supers to see this sight. Obviously, this unwelcome visitor had got as far as the queen excluder before being spotted, which is a bit worrying she’d made it so deep inside the hive. My girls were not about to let her go once they found her though, tumbling over and over, biting and I am guessing trying to ball her to overheat and kill her. I guess failing that they could have gone for the kamikaze route and stung her in the musketeer fashion.